Anders Leonard Zorn (18 February 1860 – 22 August 1920) was one of Sweden's foremost artists. He obtained international success as a painter, sculptor and etcher. 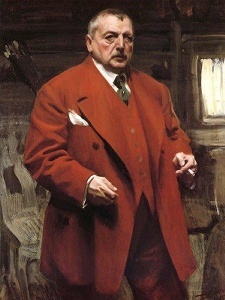 Among Zorn's portrait subjects were King Oscar II of Sweden, and three American Presidents, Grover Cleveland, William H. Taft and Theodore Roosevelt. At the end of his life, he established the Swedish literary Bellman Prize in 1920. Title: "Frederick Keppel, Art Dealer"
Sheet size: 7.5" x 5.75"